DS-11 FX Series of Spectrophotometer / Fluorometers combine UV-Vis absorbance and fluorescence methods in one compact , maintenance-free instrument. Rapidly quantify seven orders of magnitude of nucleic acids and protein samples selecting your choice of UV-Vis or Fluorescent modes. Unique all-in-one absorbance and fluorescence design. The choice of microvolume or cuvette absorbance and fluorescence methods delivers unmatched flexibility and dynamic range. Coupled with the DeNovix dsDNA quantification assays, a range of 0.5 pg/µL to 37,500 ng/µL can be rapidly measured. Easy to learn. Fast to use. 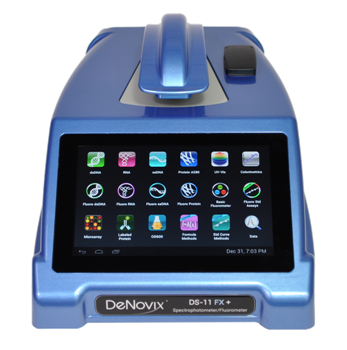 DS-11 FX Series instruments are powered by intuitive, pre-installed DeNovix EasyApps® and a breakthrough AndroidTM touchscreen interface. Dedicated applications ensure error-free operation and sample to data in under 4 seconds. Every instrument is ready for absorbance and fluorescence measurements right out of the box – no PC set-up or software installation. Fluorescence Freedom! DeNovix fluorometers give scientists the flexibility to choose any fluorescent assay, not just the assays supplied by one manufacturer. Fluorometer apps are pre-configured for common commercially available assays measured in standard 0.5 mL thin-wall PCR tubes. Four fluorescent channels encompass a wide fluorophore excitation (361-662 nm) and emission (435-740 nm) range. Calibration and Maintenance free. SmartPath® Technology ensures the DS-11 FX is always accurate and always precise – no performance drift and no service down-time. Our patented* design controls the pathlength in real-time while compressing the sample during analysis. Be confident in results from 1µL, even for difficult to measure samples like protein, thanks to SmartPath® Technology. *Patent US9442009 – Apparatus and Method for Making Optical Measurements of Samples. Connect to Your Results. Built-in Wi-Fi, Ethernet and USB allows easy export of data you want in the format you need. Email a CSV or color jpg of your results…save data to LIMS or network drives…print results or graphs to network and label printers…and more!